Shenzhen aims to electrify its entire taxi fleet by 2020. 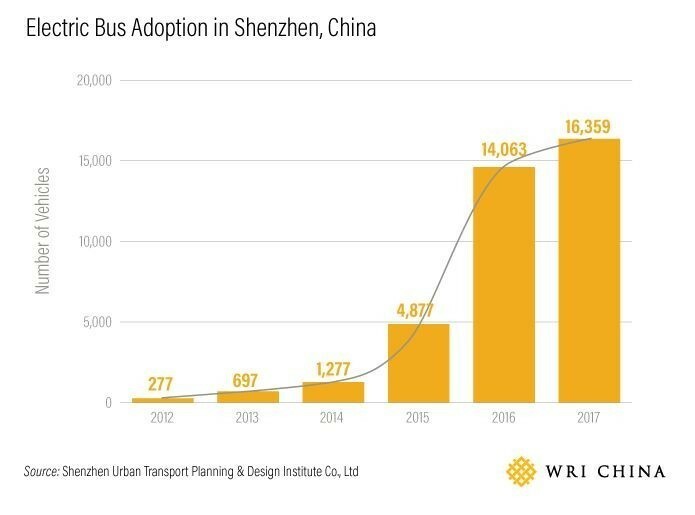 Shenzhen in China is the world’s first major city to run an entirely electric bus fleet. Some 16,000 buses in the city are electric. And its taxi fleet isn’t far behind. Over 12,000 (62.5%) of the city’s cabs also run on electricity. Shenzhen aims to make that 100% by 2020. To keep its electric buses running, the city has built 510 charging stations equipped with 8,000 charging poles. At Qinghu Bus Terminal, the Western Bus Group installed more than 30 charging poles in September. “A bus can be fully charged within two hours and the charging poles can serve 300 buses a day,” said Guan Anguang, assistant manager of the terminal. Although electric buses are expensive for cities to introduce, Shenzhen bus companies got around this in several ways. Some bus operators leased, rather than bought, vehicles from manufacturers, reducing the need for massive upfront investment. The city also invested in bus operations and charging infrastructure. Shenzhen adopted a type of e-bus where a five-hour charge supports 250 kilometers of driving, sustaining almost a full day of operation. In addition, the city made sure that almost all of the bus routes had charging facilities. It also insisted that bus batteries came with a lifetime guarantee from the manufacturers. 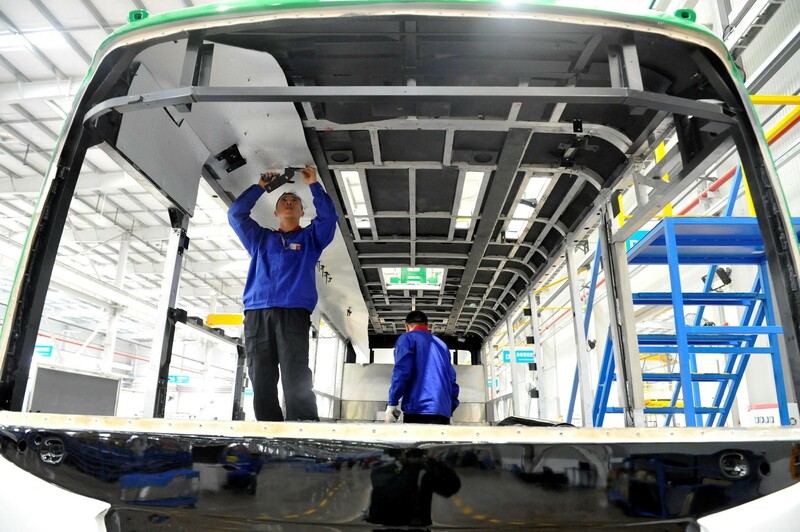 Workers assemble a vehicle at BYD, China’s largest electric bus manufacturer. Other cities, such as New York and London, are also following the electric bus route. London plans to make all its single-decker buses emission-free by 2020, and all its double deckers hybrid by 2019. New York plans to make its bus fleet all-electric by 2040. It’s not clear, however, whether other cities in China will achieve Shenzhen’s feat of electrifying its whole fleet. The government plans to withdraw subsidies by 2020, and without them, electric buses could be too expensive to introduce. 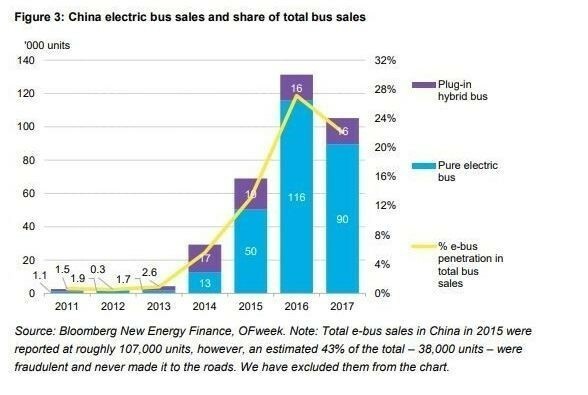 Indeed, profits at BYD, China’s largest electric bus manufacturer, are expected to fall as a result of the scaling back of subsidies as well as increased competition in the sector.